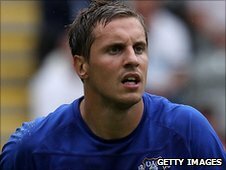 Everton's Phil Jagielka says a good start to their next campaign will be vital if the Blues are to compete for European places next season. Everton secured seventh position with Sunday's 1-0 win over Chelsea. He told BBC Radio Merseyside: "It just needs to be a decent start where we are in the top half around Christmas and then have a good crack for it then. "We've got no chance of competing for the top four when come Christmas we are in the bottom six." Jermaine Beckford's late solo effort gave Everton another impressive home win, but the England international now hopes the team can be consistent over the whole season. He said: "Yet again another slow start and a half decent finish. I don't think we've played amazing football these last 10-15 games but the results speak for themselves. "We've got to find a formula where we start the season as good as we've finished it", added the 28-year-old. "I'm sure the fans are happy to go home after beating Man City and Chelsea in our last two home games and hopefully that will give them something to look forward to next season. "We could probably do with a couple of fresh faces come the summer but that's the managers job. He decides who comes and who stays, but we've just need to give ourselves a chance. "